Times have been bad for the walruses. Federal prosecutors are currently looking into what caused 25 walruses to be found dead on a northwest Alaska beach off the Chukchi Sea last week. By Wednesday night, the U.S. Fish and Wildlife Service was able to confirm the Cape Lisburne walruses did not die of natural causes. The carcasses, nearly half of which were cubs, seem to have been shot — some were even beheaded. Before this tragic incident, however, Alaskan walruses were already suffering. As sea ice melts in the arctic, tens of thousands of Pacific walruses have been forced ashore when normally they would've rested on sea ice. The U.S. Attorney's Office is now assisting the investigation of the 25 dead walruses. Officials are suspicious they might have been killed illegally for ivory, as some of their remains lack tusks. Walrus ivory is valuable for jewelry and crafts, and only Native Americans in Alaska can hunt walruses legally, but they must still follow the Marine Mammal Protection Act (MMPA) of 1972, which states that when the animal is killed solely for ivory (rather than sought for meat), it is an act of poaching. USFWS spokeswoman Andrea Medeiros told the Associated Press that the agency does not intend to speculate any further on the walruses' cause of death. As shocking as the discovery, walruses have been on the decline as their habitats have continued to be threatened. Last month, more than 35,000 walruses climbed out of the ocean and gathered en masse near Point Lay, Alaska. BuzzFeed News reports that according to the USFWS, sea ice "has been steadily declining in the Arctic since 1979 along with increasing sea surface temperatures and air temperatures." This summer, the Arctic sea ice the fourth-lowest level on record, according to the National Snow and Ice Data Center. It's the seventh time in a decade that they've have been driven out of the Chukchi Sea by the warm water temperatures. Without ice, the walruses will likely be stuck on shore until ice begins to freeze again this fall. 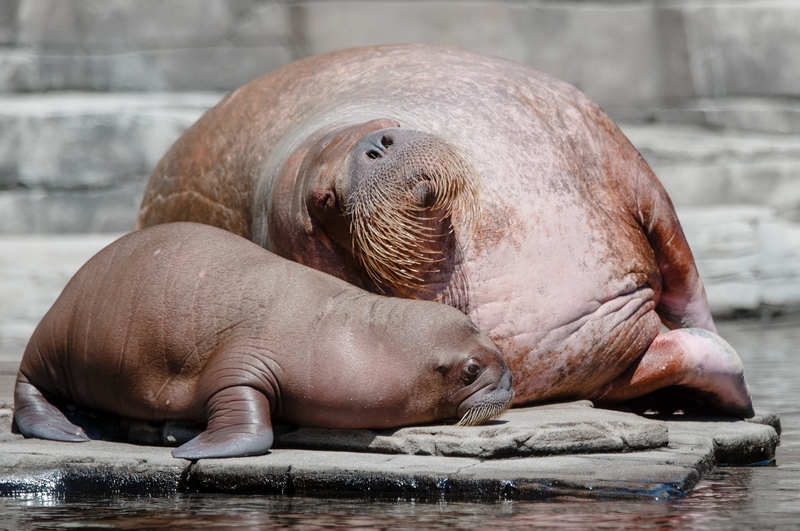 Walruses feed on clams, worms, and snails on the ocean floor. Because they cannot swim indefinitely, sea ice is useful for resting. This is particularly useful for females and pups, who can't swim as far as male walruses. Even existing sea ice has recently receded to waters that are beyond the diving range of most walruses, away from the shallow continental shore. The hope is that we will soon have some form of climate change policy in place to mitigate these risks for the Pacific walruses. Hell, for walruses everywhere.